This home away from home has been mostly renovated, and comes with all mod cons. The well equipped kitchen has a dishwasher, large electric frypan,large slow cooker, toasted sandwich maker and coffee plunger as well as some basic pantry supplies.Ipod dock,CD player Freeview TV,DVD player and DVD library. Ideal for family get togethers or groups of sports people. Warm, sunny and spacious, this house is fully insulated, and has an awesome woodburner, with warm air ducts to the bedrooms to keep it nice and toasty. The open plan living area provides a great space for entertaining. Bike / Ski shed , dry and secure. Fireguard available for toddlers. Great new playground close by for older kids, as well as new mountain themed mini golf at Schnapps and indoor climbing wall at NP Backpackers. Situated on a quiet, family friendly street, with off road parking , all local amenities are only a short stroll away. There is a fantastic selection of 6 eateries in town, with cafe, pub and restaurant meals available, as well as a local 4 Square for groceries at the local service station (open 7am - 7pm)Takeaways in town too. National Park is an adventure playground. 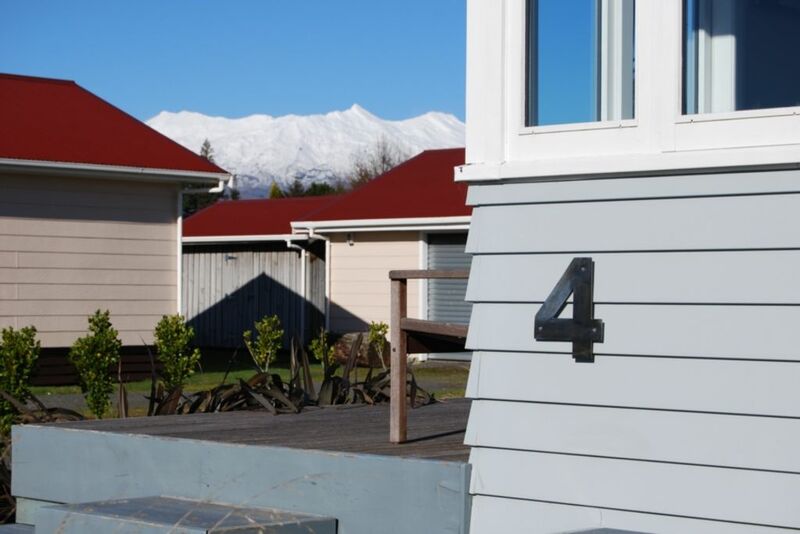 Come for skiing, tramping or biking (off road, mountain biking and motor biking trails nearby).Tongariro National Park is on the doorstep, Whanganui National Park is nearby.Bike tracks include the 42 Traverse, Fishers Track and Old Coach Road ( which is part of the Mountains to Sea Cycleway). Walk the iconic Tongariro Alpine Crossing or one of the many other excellent options.Whakapapa Ski field is 15 minutes away, Turoa about 40 minutes.The hotpools at Tokaanu are perfect for a soak after a hard day, and only 30 minutes drive away.An indoor climbing wall and cycle hire are available in the village. Arrival from 2pm. Departure by 11am. Cleaning fee also includes rubbish disposal . Love to explore the wider Tongariro area and enjoy sharing our home with others so they can also enjoy what the region has to offer. We mostly tramp or cycle, but sometimes just soak up the fabulous views and natural surroundings, or visit the thermal pools at Tokaanu. Weve been coming here for some time, but still find new places to explore. Fantastic mountain views which can be enjoyed by all. Warm and spacious house, with lots of off street parking. Closest village to skiing at Whakapapa and Tongariro Alpine Crossing. Perfect location to access many adventures and stunning outdoor environment. Lots of nearby options for dining out and takeaways. Views of all three mountains - Ruapehu, Ngaruahoe and Tongariro. Heat transfer system provides heat from fireplace to bedrooms. All beds are freshly made up with linen. Pantry items available when you just need a little of something: Salt, Pepper, Flour, Spices, Oil, Dressings, Tomato Sauce, Sugar, Tea, Coffee, Milo, Paper Towels, Plastic Wrap, Aluminium Foil. Large wooden table seats 8 Two seater sofa also in dining area. House was perfect, clean and tidy, awesome location, def will stay again and highly recommend. A very warm, clean & comfortable well set up home & all & more in location. Easy to locate in a small friendly village. Spot on for what we wanted! Great to have you and very happy for you to stay again. Property in great order. nice to have the fire ready to light when we arrived. Close to playground and town. Tongariro National Park is an adventure playground, which makes National Park Village an ideal base to explore from. Skiing at Wahakapapa or Turoa and nearby hot thermal pools at Tokaanu for winter. Tramping / hiking / cycling options galore all year round. Huge selection of short family friendly walks to more challenging day walks on the mountains or in forests nearby. Tawhai Falls , Lake Rotopounamu, Tama Lakes, Taranaki Falls, Old Coach Road, Ohinetonga Track, Ridge Track. Tupapakurua Falls track leaves right from the village. Cycling: Close to many cycle trails of all grades: Marton Sash and Door and Fishers Track both leave right from the village. Others nearby are: 42 Traverse, Old Coach Road, Mountains to Sea Cycleway, Bridge to Nowhere, Tongariro River Trail, Tree Trunk Gorge. Cycle hire and shuttle transport available in the village. Trout fishing options not too far away. Rail cart trips along the Forgotten World Highway are fun. Quad bike adventures are 10 minutes away at Raurimu. Kayaking / canoe trips available on the Whanganui River. There are many dining and takeaway options in the village, all within a 10 minute walk. There is a well stocked grocery store at the service station.